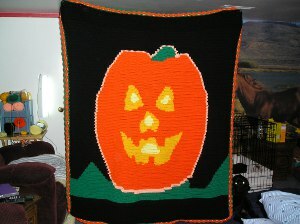 Keep warm in the autumn months with this Cozy Halloween Blanket. Free crochet afghan patterns like this one will give you something to do on blistery fall days and, when it's done, this blanket is great for snuggling in and watching scary movies! 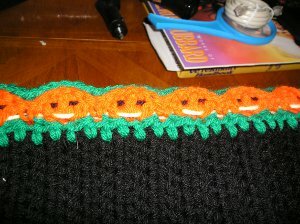 HDC IN SECOND ST FROM HOOK TO THE END OF THE ROW, CH 2 TURN, HDC IN FIRST ST ON ALL ROWS. ROW 25 – GR 65 ST, P 31 ST, GR 64 ST. SKIP NEXT ST SC IN NEXT ST AROUND. TURN WORK AROUND AND USING FRONT LOOPS MATCH PATTERN FROM LAST ROW. CHANGE TO GR SC IN BOTH INSIDE LOOPS OF LAST TWO ROWS. AT ONCE TO JOIN WORK. FASTEN OFF. OPTIONAL: USE BK OR Y TO MAKE FACES IN SHELLS BEFORE CLOSING SHELLS WITH GR. How many yards of each color do you need for the afghan? Question: The beginning of the instructions say "160 cast on"...is this a tunisian stitch or is this a standard 160 chain? Thank you! Very cute pattern!